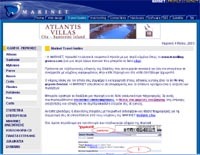 Directory of hotels all over Greece. Greece travel guide with information on sight seeing, archaeological monuments, hotels, travel agencies, car rentals and more. The cycladic island of Santorini, Greece, complete guide.A virtual tour in Santorini island. The cycladic island of Mykonos, Greece, complete guide.A virtual tour in Mykonos island. Crete island guide with information on hotels and more. Rhodes island guide with information on hotels and more. Naxos island guide with information on hotels and more. Paros island guide with information on hotels and more. Corfu island guide with information on hotels and more. Kefalonia island guide with information on hotels and more. Kos island guide with information on hotels and more. Zakynthos island guide with information on hotels and more. The ionian island of Lefkada, Greece, complete guide. 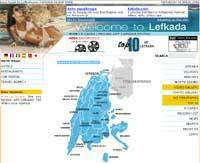 A virtual tour in Lefkada island. Chios island guide with information on hotels and more. Lesvos (mitilini) island guide with information on hotels and more. Samos island guide with information on hotels and more. Syros island guide with information on hotels and more. Milos island guide with information on hotels and more. 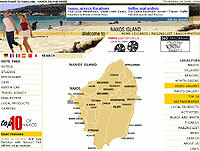 Ios island guide with information on hotels and more. Sifnos island guide with information on hotels and more. Tinos island guide with information on hotels and more. Andros island is just a couple of hours away by ferry, either from Piraeus or Rafina. Amorgos island guide with information on hotels and more. Skiathos island guide with information on hotels and more. Skopelos island guide with information on hotels and more. Alonissos island guide with information on hotels and more. 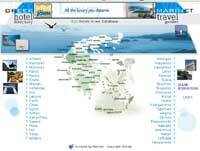 Halkidiki guide with information on hotels and more. Thessaloniki guide with information on hotels and more.